Integrase catalyzes viral DNA integration into the host chromosome, by performing a series of DNA cutting and joining reactions. The first step is site-specific endonucleolytic cleavage of the 30-ends of the viral DNA. 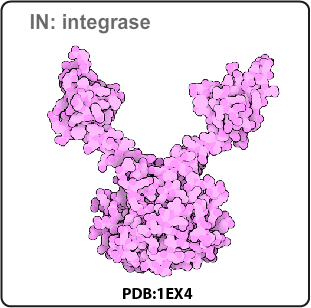 Secondly, it participates in the assembly of the pre-integration complex (PIC) on the ends of the viral DNA, which migrates into the host nucleus. Lastly, integrase catalyzes the insertion of the viral DNA into host chromosomal DNA (strand transfer step). Interacts with LEDGF/P75. LEDGF/p75 recognizes histone H3 tails containing trimethylated Lys36 (H3K36me3), which is an epigenetic marker for active transcription units and positively correlates with HIV-1 integration sites. 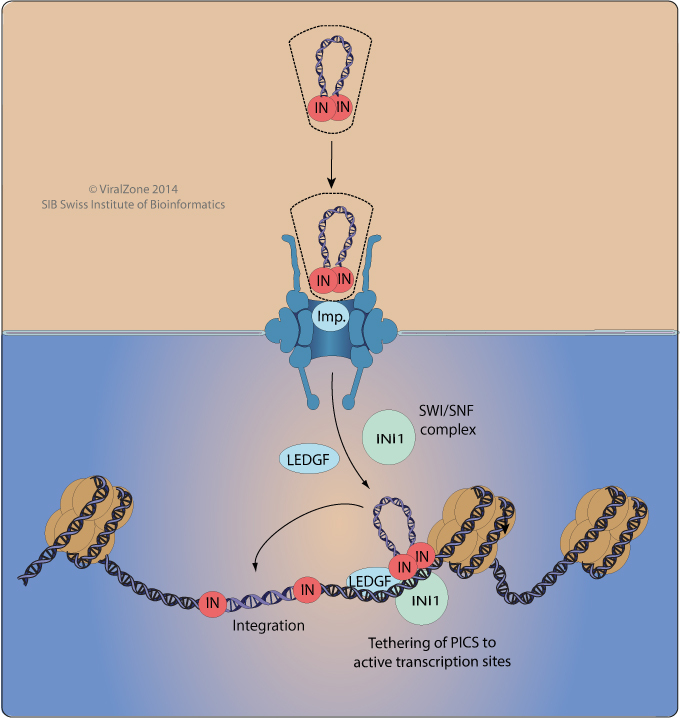 Interacts with INI1, a subunit of the SWI/SNF chromatin remodeling factor. Antiretroviral Drugs Integrase inhibitors (INIs) inhibit the HIV Integrase protein to prevent integration of the viral and host genomes and inhibit HIV replication.